For this Month's We Knead To Bake, Aparna let us to Bake our own desired Bread. I have a huge list of breads in my Bookmarked folder. And this Garlic Bread From Scratch is one of the bread in my to do list and is one my family's favorite bread. 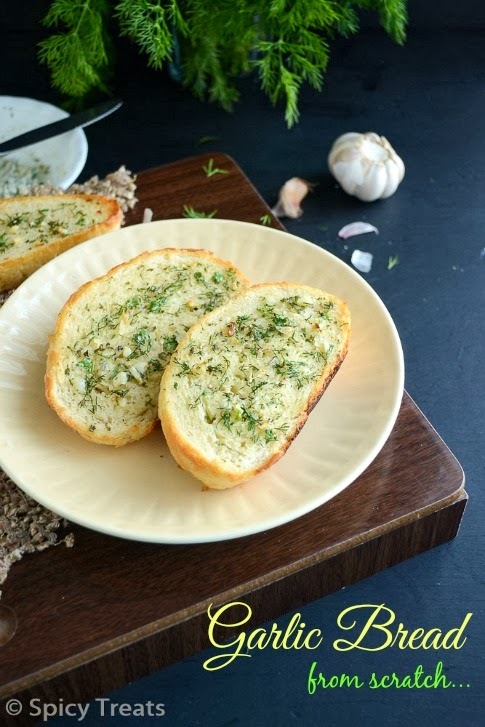 I often make this garlic bread with store bought breads. But for the first time tried it from scratch and it was so perfect. we just loved it, i doubled the original recipe and made 2 loaves. First day served as a snack and the other day we had it for dinner along with Pizza. No one will say No to this crispy crust, soft centered garlic flavored bread. And the method also simple and enjoyed baking this flavorful bread for my kids. 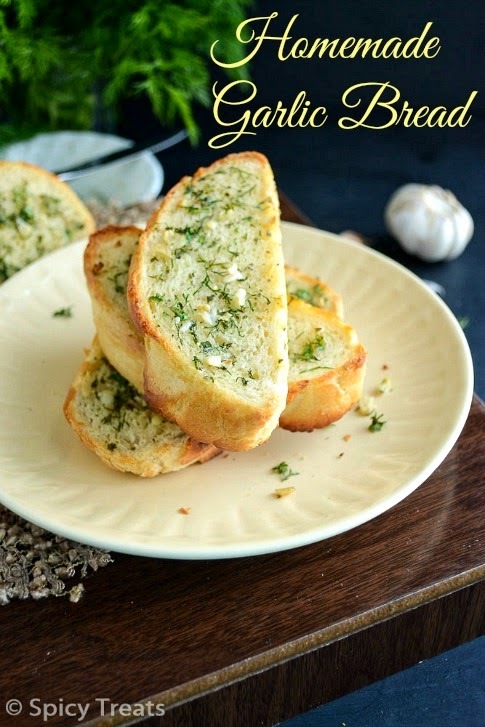 This is a must try for all Garlic bread lovers, sure a keeper recipe. I decided to make it again and again for my kids. Mix the yeast and sugar in a measuring cup(this helps to prevent lumpy), add the cup of warm water and stir together. let sit for 5 minutes. Then in a mixing bowl, add 2 cups flour and salt and mix well, then dump in yeast mix and stir until a soft dough forms. Knead until dough is smooth and elastic, adding more flour if needed. don't add so much flour that it becomes dry, it should still be slightly sticky. Coat the bowl with oil and place the shaped dough and smear oil over the dough and wrap the bowl with plastic wrap and keep it in warm place till it doubles in volume. once the dough has doubled in size, punch it down and form into a long, thin loaf. place on a parchment lined cookie sheet. slash diagonally with a sharp knife 3 or 4 times. place it back in a warm place or oven with its light turned on until it's doubled again. Bake in a 375 F oven for 20 minutes or until the loaf is golden brown on the top. While the loaf is baking in the oven make the garlic butter by mixing the ingredients for garlic butter-butter,olive oil,dill,salt and chopped garlic. and bake again at 400 F for 10 minutes. After that remove the foil paper and keep it in oven for 5 more minutes or until the slices are crispy on the outside and soft in the center. I think, we can directly mix instant yeast with flour since within a minute it turned frothy. As it is my first try, i stick to the original recipe will update this later. You can also slice the warm bread into 1 inch slices and apply garlic butter and bake it oven. Here i used fresh dill leaves, you can also use dried dill or dried parsley or fresh parsley. 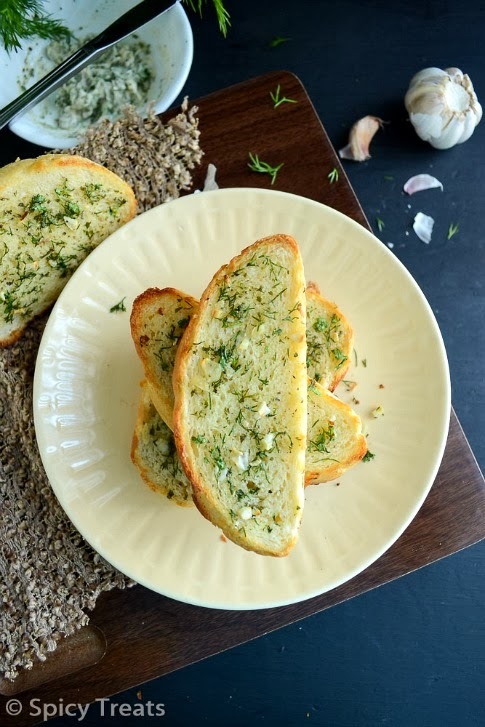 Garlic bread looks so interesting and inviting........ B'ful clicks too!! loved this completely such beautiful bread nicely baked. Amazing garlic bread, my fav one. Bookmarked it. Loved ur all clicks, flavourful n perfect bread!! Bread looks delicious. Have to try this cause its my kids favorite too. Your garlic bread looks yummy. I love that you used dill. Yes, you are right, instant yeast does not need to be proofed, it is added directly to the flour. Loved ur all clicks, flavorful n perfect bread!! 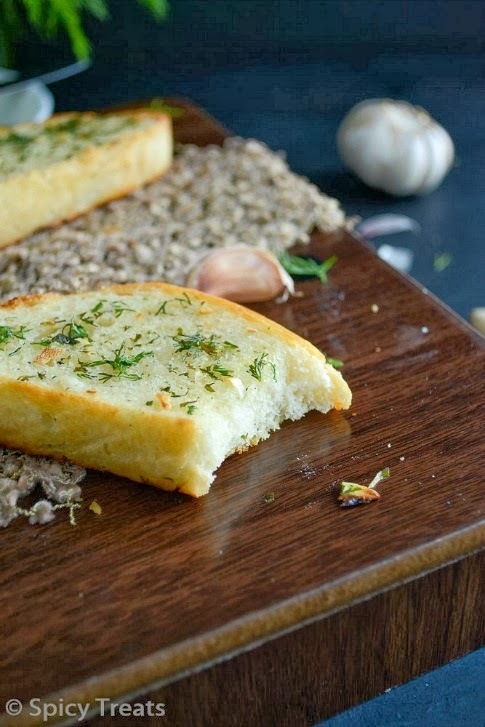 love the dill leaves flavoured garlic bread ...have bookmarked it . 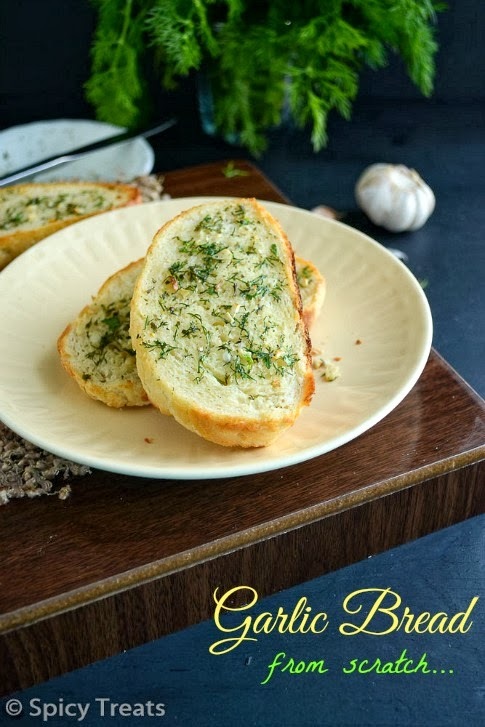 Beautiful clicks.. And the bread looks perfect and flavorful..
Garlic bread looks perfect.My family loves garlic bread and I am sure they are going to love this. This is in my 'to do' list for a long time. looks perfect with nice clicks. Wow, wat a wonderful job Sangee,that too from Scratch, am loving it..I want to have a slice rite now. I made this to go with spaghetti for dinner today and it was great! The only thing I did differently is that I put the dough in the bread machine to mix and rise. • alguns textos jamais contam histórias ficcionais. É só caprichar no lápis preto rente aos cílios. doutor e seus alunos escolhem certa aborrecimento.